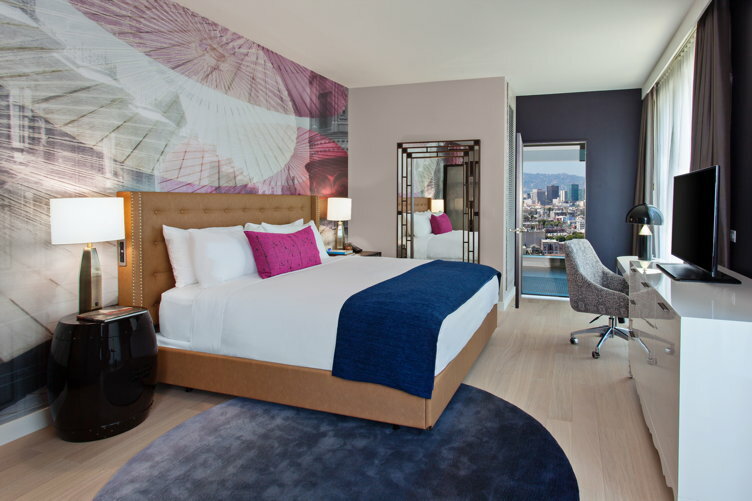 Los Angeles has been a hot bed for new hotels in the last few years, with 23 openings and another 32 on the way. Here, we take an inside look at five of the best—as well a 30-month remodel that has one of L.A.’s most iconic properties feeling oh-so fresh again. 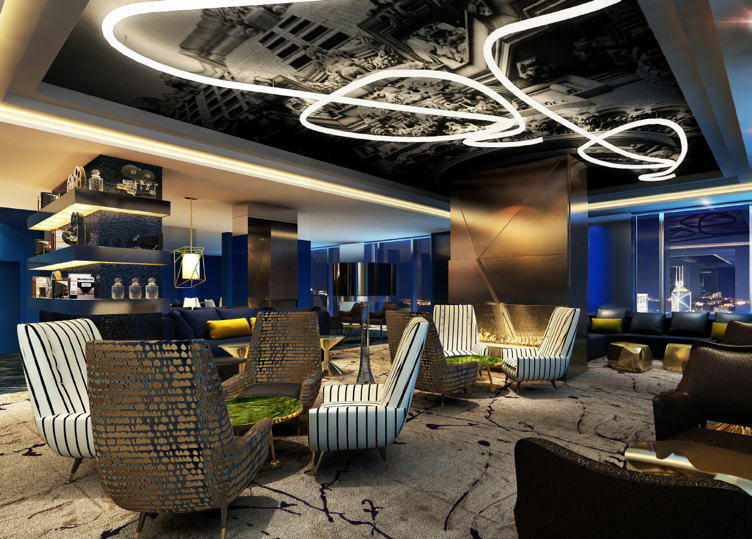 When the Nobu name is attached, there’s no doubt that the hotel or restaurant in question is going to be something luxe, distinctive and special. 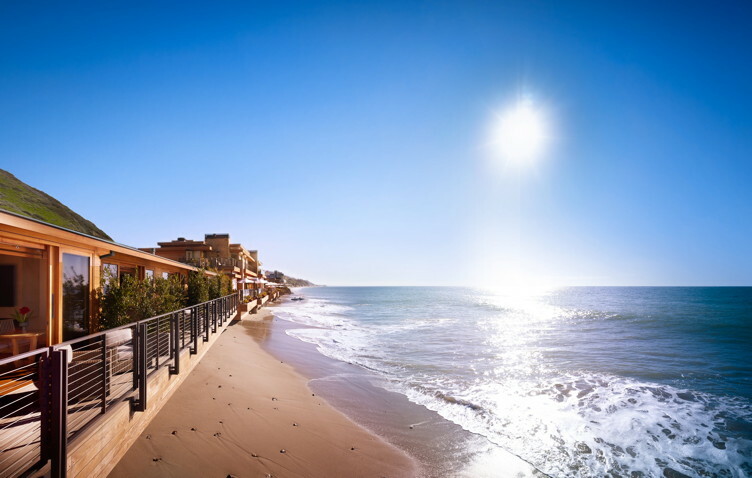 In typical form, the brand’s new, 16-room hotel, located on Malibu’s fabled “Billionaire Beach,” does not disappoint. This property is unique, ethereal and very, very private. 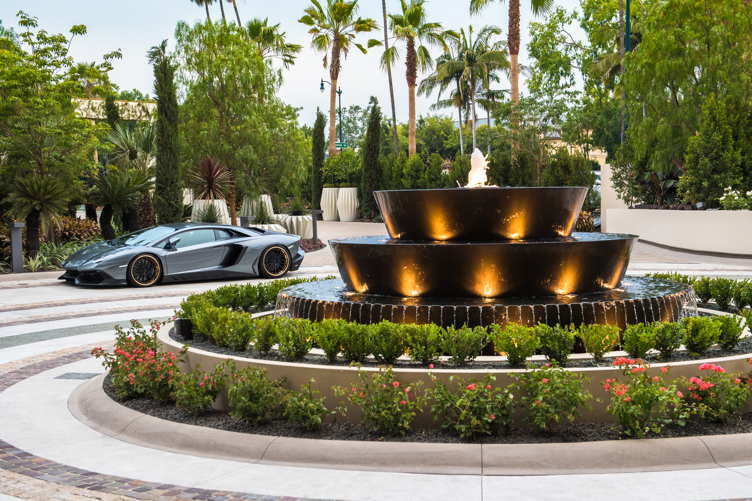 The staff await your arrival the moment you pass through a private wooden gate bearing the Nobu logo (even if, yes, you’ve made a long journey in your hybrid—there are two Sema Connect Charging Stations on site). 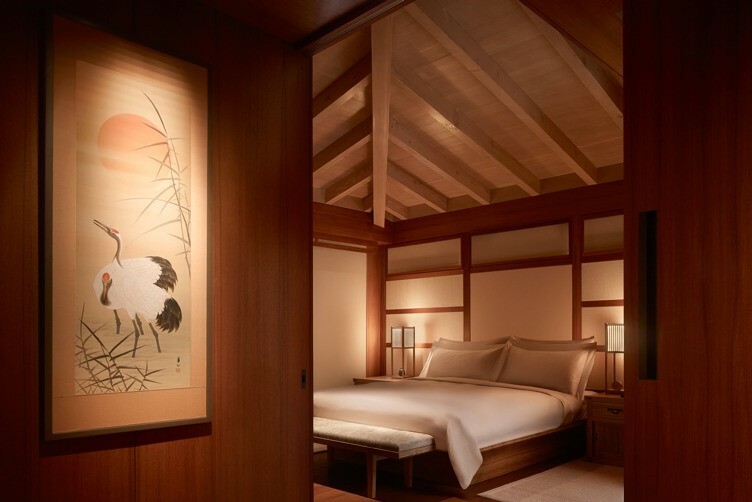 Nobu Ryokan Malibu—located in the former 1950s-era beach motel Casa Malibu—is the first of the Nobu Ryokan Collection: individual and exclusive retreats located in exotic destinations, for the traveler looking to truly get away. As conceived by co-owners Chef Nobu Matsuhisa, Oracle CEO Larry Ellison, two-time Academy Award winner Robert De Niro and film producer Meir Teper, the property is modeled after a traditional ryokan, or a Japanese inn, but with a cool, purely SoCal feel, with minimalist materials of teak, bronze and limestone throughout to create the feeling of Omotenashi, the Japanese art of hospitality. 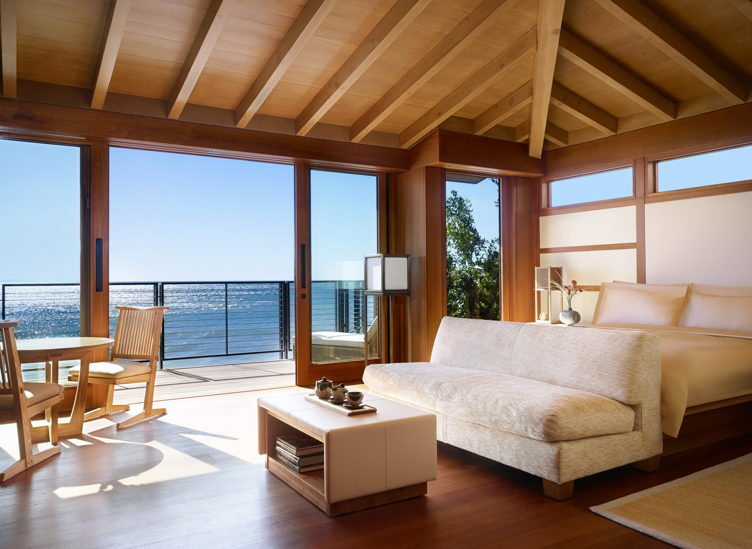 You’ll breathe a quiet sigh of relief the moment you set foot in your room–especially if it’s facing the Pacific. 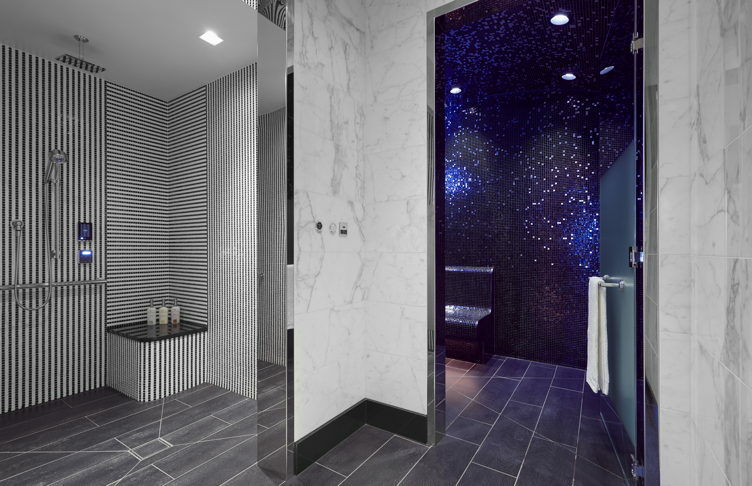 It’s color scheme, materials and lighting are all designed to relax and afford the ultimate reflection. 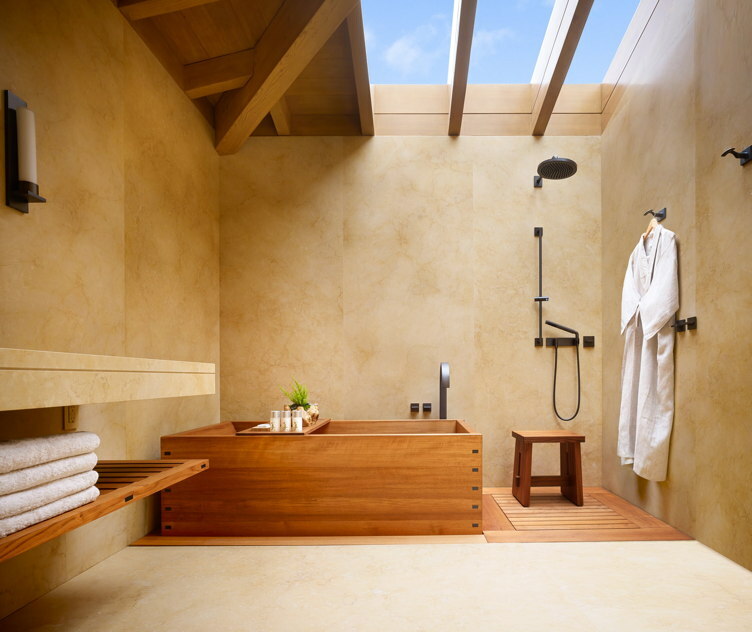 There are the bath amenities by Mauro Spina of Beverly Hills and Red Flower; Bose sound systems; in-room Nespresso and Ikaati tea; Direct TV; goose down duvets and featherbeds; traditional linen Yukata robes; rainfall shower heads; and even a traditional Japanese tea service awaiting your arrival. 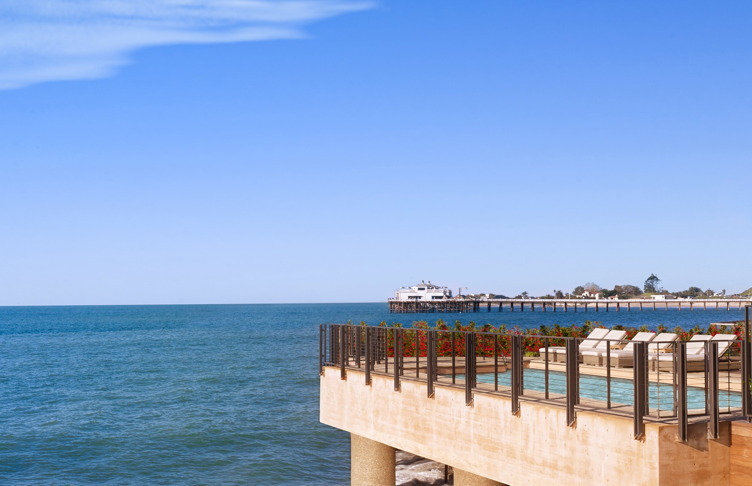 It’s hard not to love a spot where you can wake up to the sound of the crashing ocean waves and spot dolphins frolicking from your patio… or from the open-air gym, if you’re so inclined, though the hotel also offers access to the Malibu Racquet Club. 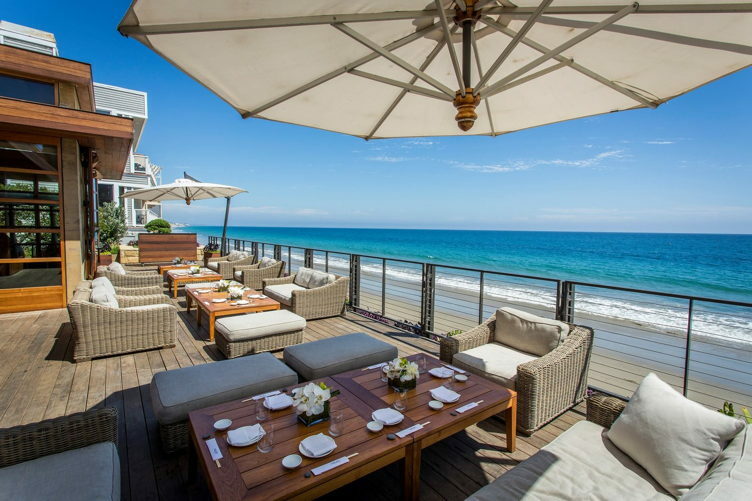 The only thing that could make this five-star experience better is, of course, dinner at the crowning jewel of Nobu’s restaurants, Nobu Malibu. 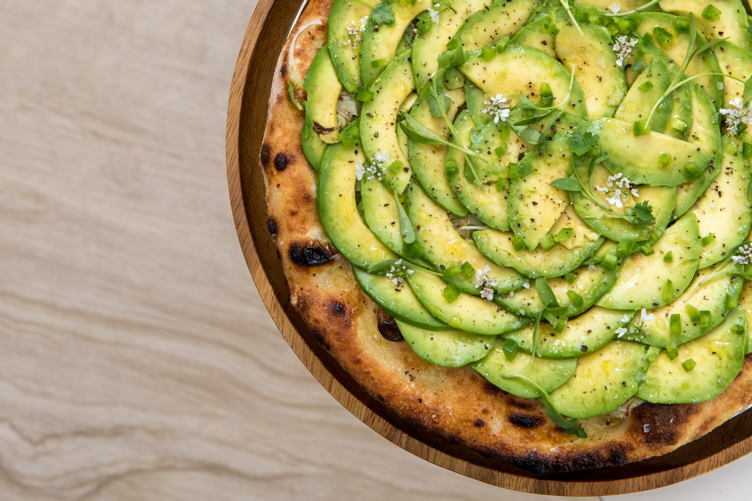 With just Soho House’s Little Beach House as a buffer, you can literally walk over to the hottest restaurant in town, where star-spotting isn’t just a possibility, it’s a reality (and on the daily, too). You don’t need to gorge yourself on Matsuhisa’s signature sushi dishes to have a good time, though you might not be able to help yourself. Dig in to spicy miso chips, Bigeye and Bluefin toro tartare, black cod with miso, rock shrimp tempura with creamy spicy sauce and scallop truffle chips, among many other mouth-watering dishes, grab a glass of sake and watch the sun set. Then, head back to your room, breathe a sigh of relief, and fall asleep to the sounds of the sea. It’s pure bliss. 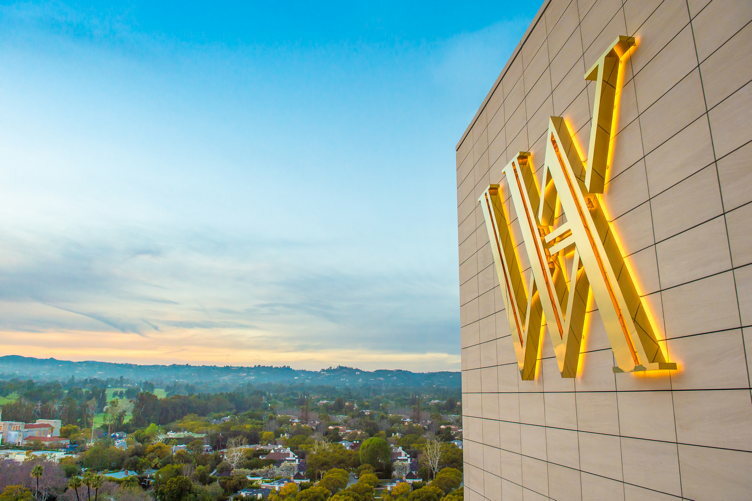 It’s hard to believe that it’s almost only been a year since the Waldorf Astoria Beverly Hills opened its doors (on June 1, 2017, to be precise), because this LEED Gold-certified haute hotel is a firmly established leader among L.A.’s luxury stays. 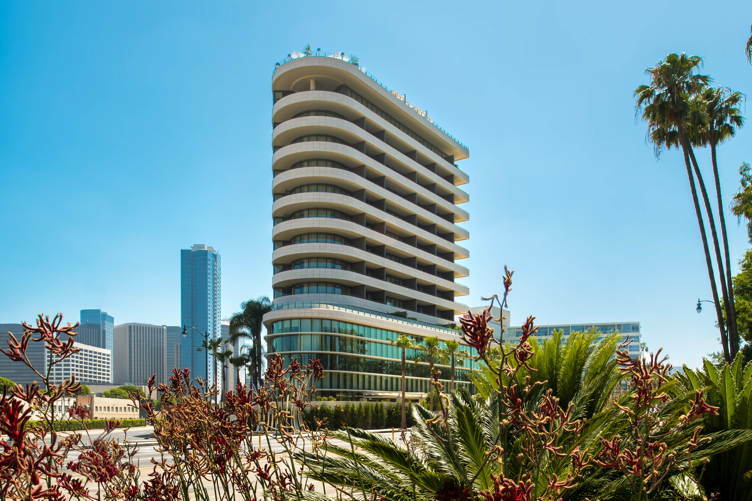 This hotel is truly massive: it’s compromised of 12 stories, 119 elegantly appointed rooms and 51 suites—including three Villa suites and a grand presidential suite—with epic views of the Los Angeles skyline from each and every private balcony. 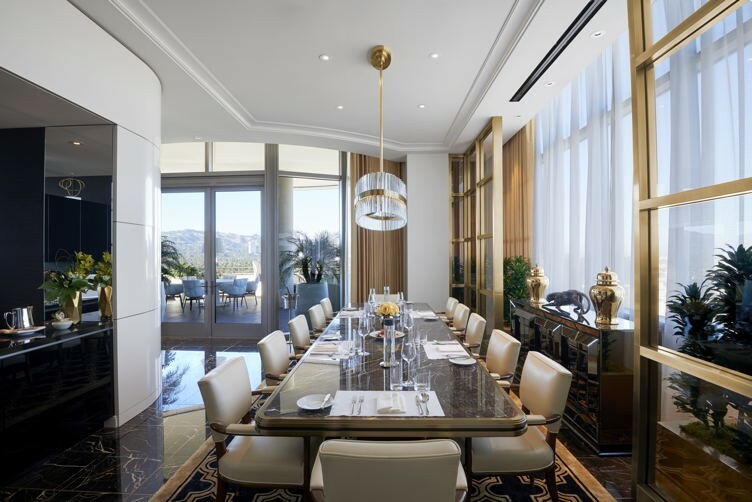 The contemporary interpretation of the rich history of California’s Streamline Moderne style was the collaborative effort of the world-renowned teams of Gensler and Pierre-Yves Rochon Inc., the designer of Paris’ famed George V hotel. 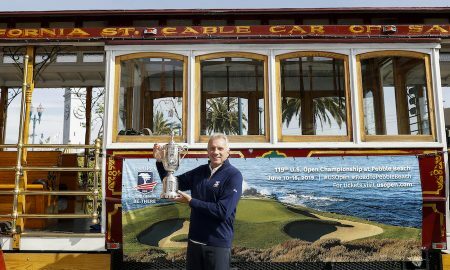 In fact, it’s the first time in over a decade that the team has brought its certain je ne sais quoi to California—and the result is powerful. 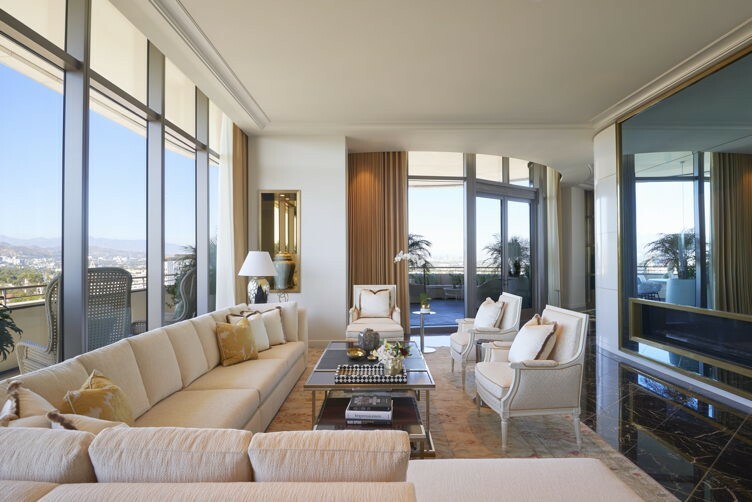 It’s George V in the SoCal way, with floor-to-ceiling windows, burnished bronze, custom Italian marble and Lalique installations throughout the interior. Opulence is the name of the game. Its modern amenities nicely echo its décor. 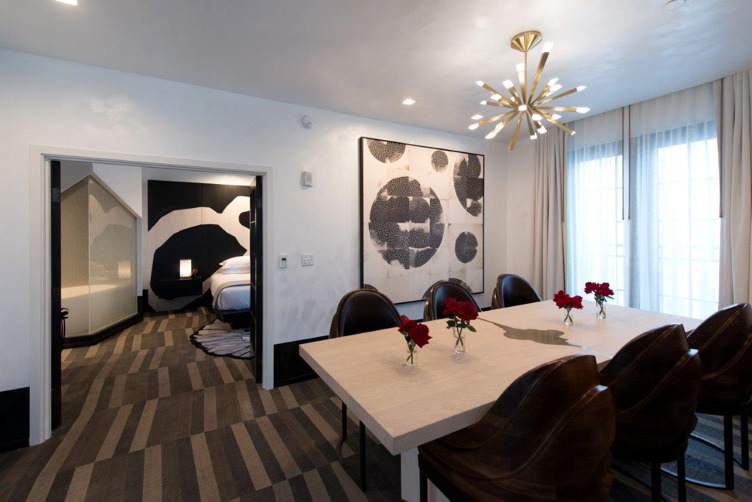 The rooms are rife with tech toys, including state-of-the-art TVs with Netflix, Hulu, Airplay and Meerkat access; a Creston smart home system that controls the entire room with the flick of a switch; and even Bluetooth-enabled speakers in the bathroom. iPads are also used to do everything including calling the valet and ordering room service. Beauty services mostly take a modern approach as well. 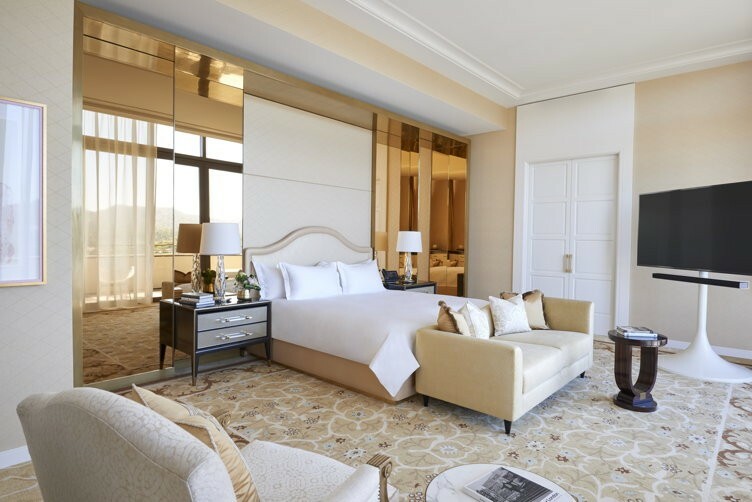 The Waldorf Astoria Beverly Hills is the first hotel in Southern California to ditch its stodgy travel hairdryers and offer guests something they only wish they could get their hands on—Dyson’s revolutionary Supersonic hair dryer (which is offered in ALL rooms, as well as in the La Prairie Spa). 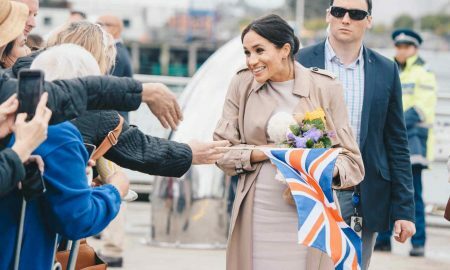 The latter, while being a traditional brand and offering a range of treatments that incorporate gold, diamonds, platinum and caviar, offers a cool and unusually healing experience post-treatment. Guests are offered a box of stones, and told to pick one that speaks to them… a refreshing offering from an established luxury brand. 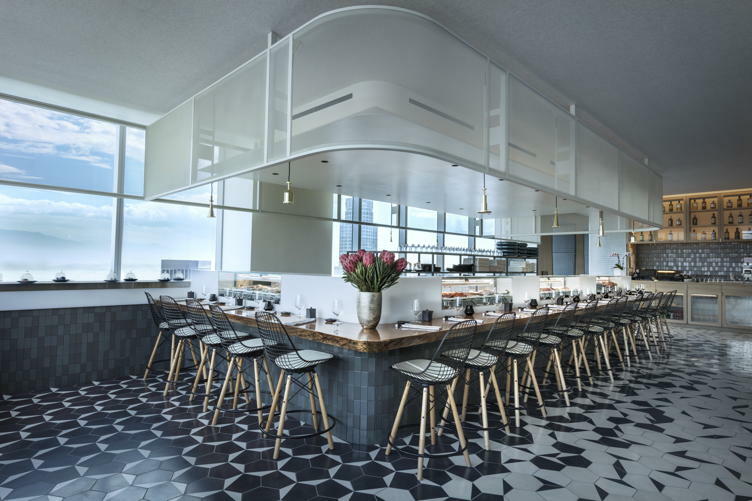 Elsewhere throughout the hotel, there’s The Rooftop by JG, a chic respite with stellar views of the city, and one of the hottest restaurants to open in the last year: Jean Georges Restaurant, helmed by master Chef Jean Georges Vongerichten. The eatery is a nice foil to Vongerichten’s classic French fare: a light and neutral color scheme of creamy whites and rich caramel accented with bronze finishes; terrazzo flooring inlaid with bronze; a tall, sloped ceiling; long leather banquettes; a Murano glass chandelier; rosewood and pallisander furniture; and four large lemon trees that flank two sets of double doors that open to a Mediterranean garden-inspired dining terrace. 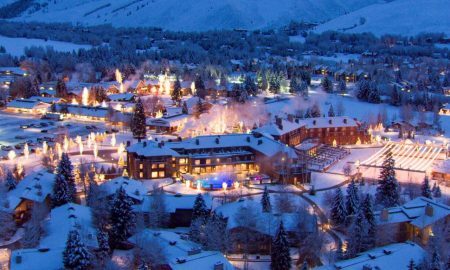 Standout menu items include his specific caviar creations (make sure to try the softly poached organic egg with Oscetra caviar, yogurt and herbs); fish dishes like Santa Barbara sea urchin and grilled octopus; and fabulous flatbreads with truffles and Fontina cheese or an avocado carpaccio. Make sure not to miss the chocolate cake for dessert: your mouth will thank you later. 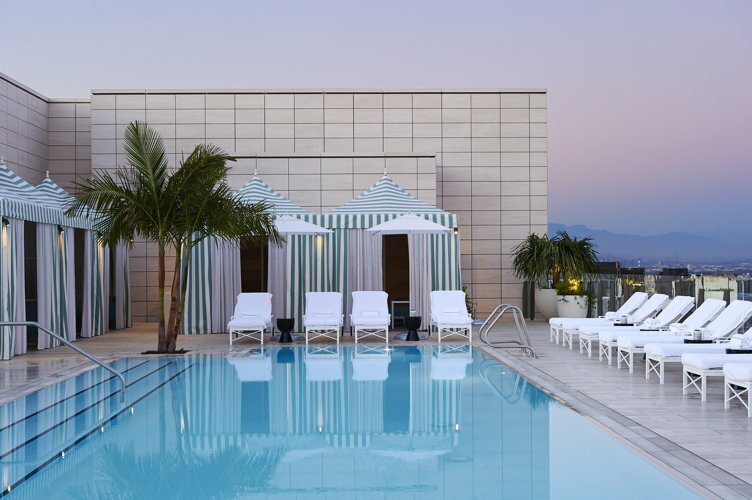 For those that want to be in the heart of the West Hollywood action and still feel like they’re tucked away in the Hollywood Hills, the Kimpton La Peer is your answer. This five-star property is destined to become the very heart and soul of the West Hollywood Design District. 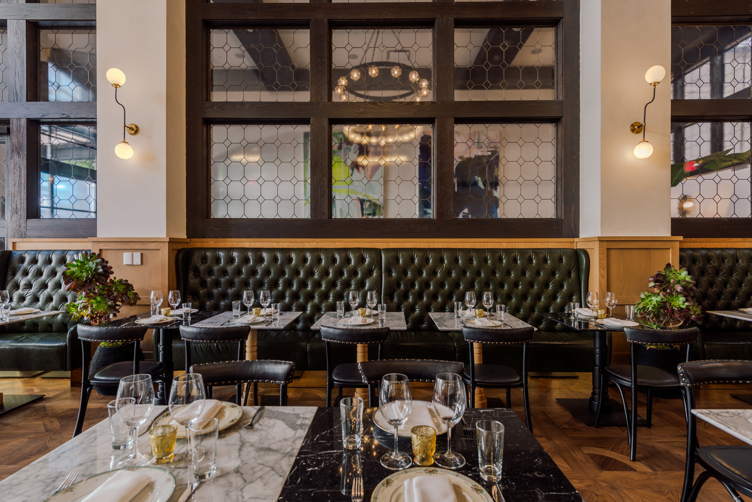 It anchors some of the best restaurants in the city—Craig’s, Gracias Madre, and Au Fudge are just a few—and is a stone’s throw from art galleries, A-list shopping and top-notch salons like Andy LeCompte, and is entirely impressive in its own right. 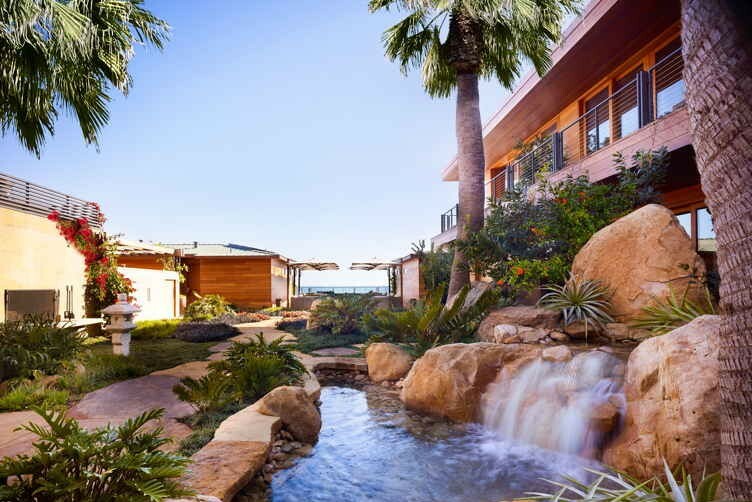 The 105-room, design-forward hotel truly embodies the neighborhood’s emphasis on design, art, and style with its urban retreat feel, a secluded pool accented by thoughtful landscaping and custom-made lanterns, a 4,000-square-foot private rooftop event terrace and handcrafted art pieces. 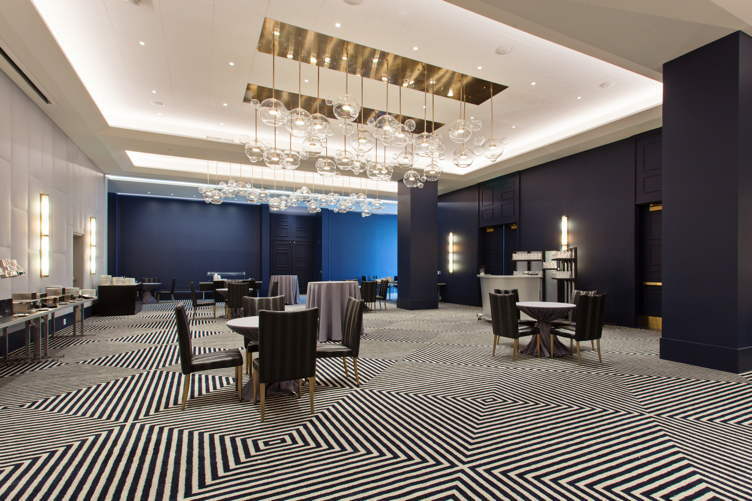 A modern aesthetic is found throughout in the hotel’s concrete and leather walls, white oak wood flooring, plaster walls, liquid surfaces, and bronze columns. 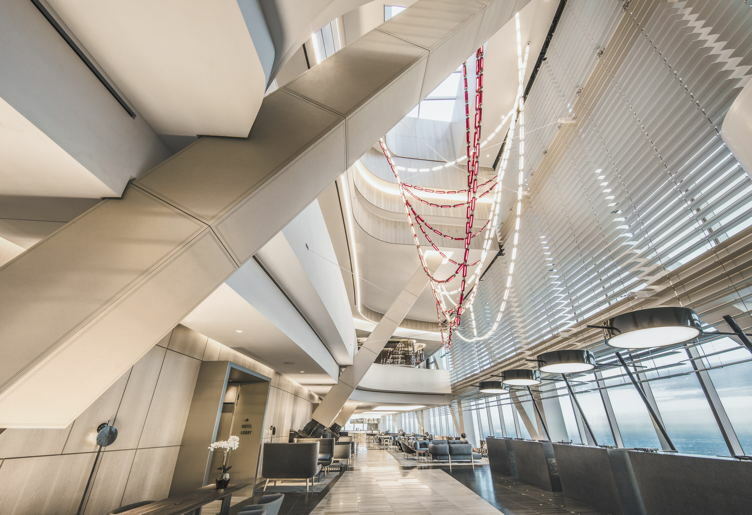 Guests will also discover bespoke designs in the curved brass ceiling details, a leather cocoon wall, and six-foot round light sconces that emit an ambient glow in the lobby lounge. 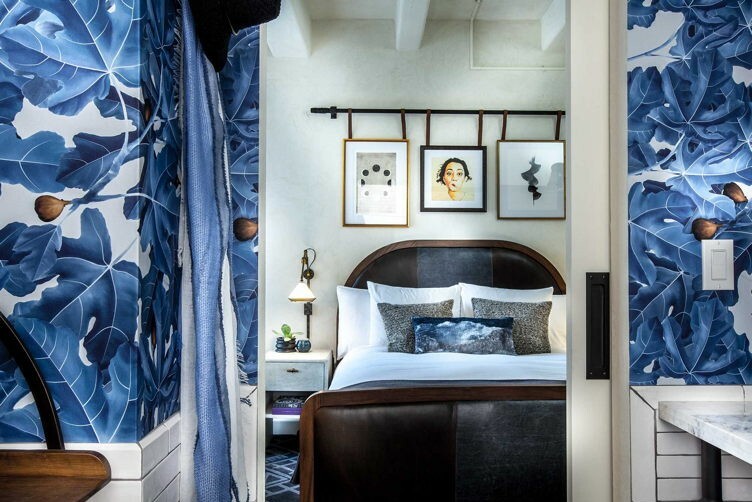 There are hand-selected paintings, photography, and poetry from designer Gulla Jónsdóttir’s colleagues and friends, and the first collaboration between internationally renowned graffiti artist Retna with artist Guerin Swing, a too-cool-for-school installation for the hotel’s backyard courtyard. La Peer’s ground floor is also home to Jónsdóttir’s studio gallery, Atelier Gulla Jónsdóttir, where guests can even buy some of the artwork and furniture found throughout the hotel. 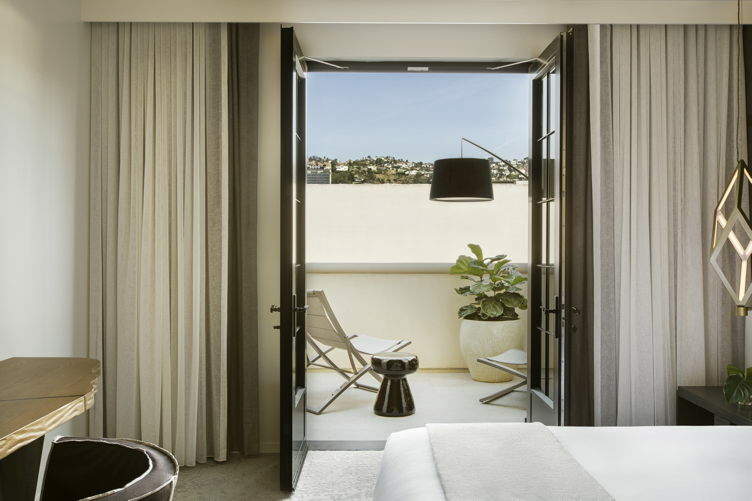 We recommend booking the fourth-floor penthouse, which features Jónsdóttir’s own furniture collection “Heimaland,” two-toned black and earth grey walls showcasing paintings and neon art and a large terrace overlooking the hills that features a lounge, dining area, greenery and a fire pit. 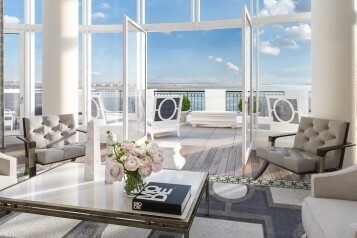 Those who don’t book this suite will still be in for a visual treat thanks to a rooftop with 360 degree views of the city. 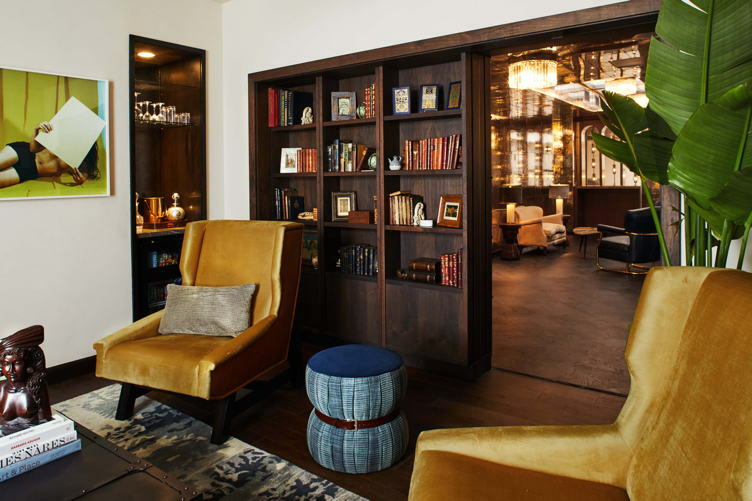 We’re going to be honest: this hotel is everything for the millennial demographic. Not only is there Kombucha Culture, Clover Juice and Toasted & Roasted coffee on tap (gratis) in the lobby, but guests can enjoy an array of tailored health and wellness programs. Environmentally friendly Jade Yoga Mats are placed in each room for complimentary use, alongside the ability to awaken to the southing sounds of meditation with the custom Yoga Wake Up app, recently featured as the “New Apps We Love” by Apple. Locally renowned resident trainers Marco Reed/Gentry Jackson oversee all fitness classes and adventure packages, and is available for individual training sessions, as well as offering diet and meal planning for guests looking to further their commitment to healthy living. A partnership with Bikes & Hikes LA provides several bike tours to explore the best of Beverly Hills and West Hollywood. Upon arrival, each guest can pick up their La PeerNeighborhood Guide, designed by local artist Katie Bright to celebrate LA’s most walkable neighborhood. The passport is a pocket-sized neighborhood guide designed as an “Instagrammable tour” of the district’s top hotspots for the arts, shopping and nightlife, all within a one mile radius of the hotel. Hotel amenities at La Peer Hotel include room service reimagined with custom picnic baskets, In Room Bottle Service that brings craft cocktails to the fingertips of every guest and a bath menu with butler service from OleHenriksen: the bath ritual menu available in every room includes the signature of lavender, grapefruit, peppermint, and rosemary or the Exotic Jasmine Bath with jasmine, rose, neroli, and gardenia. Who doesn’t want a butler drawn bath with custom blended essential oils, freshly grated cucumber eye masks, and fresh petals? Last but not least, there’s fresh fare from chef of the moment Casey Lane with Viale dei Romani, a new restaurant concept inspired by Lane’s trips to the Mediterranean coasts. The seafood-driven menu focuses on Italian fare with broader Southern French and North African influences, with options including wood-fired seafood, raw fish pasta, pizza, and the traditional chickpea crêpe Cecina served with falafel, crudo, and marinated local vegetables; as well as house-made, hand-crafted breads and pastas. 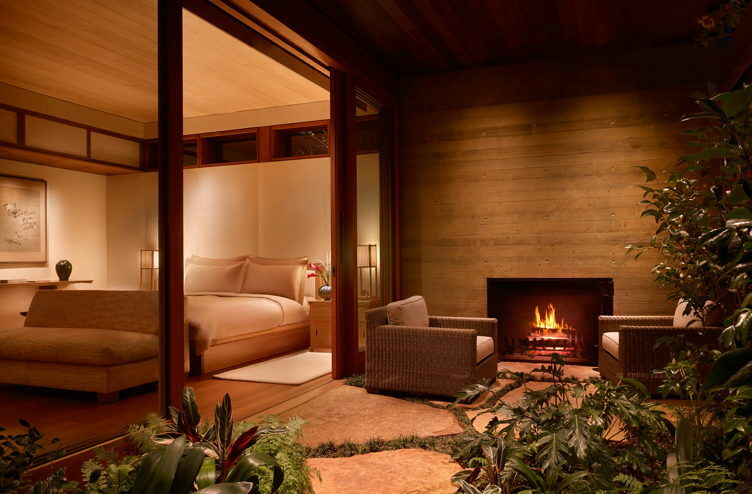 The Intercontinental Los Angeles Downtown is something truly special. Not only is the hotel housed in the tallest building west of Chicago at 1,100 feet and 73 stories high, but it is also the largest InterContinental hotel in the Americas, with views that, quite simply, take your breath away. 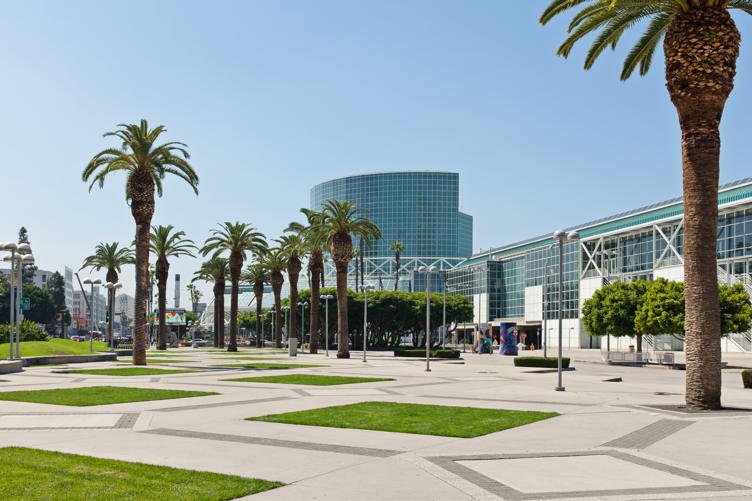 It is cool, classic and offers the best of everything that downtown L.A. offers thanks to its nexus of historic, entertainment, financial, arts and sports districts. 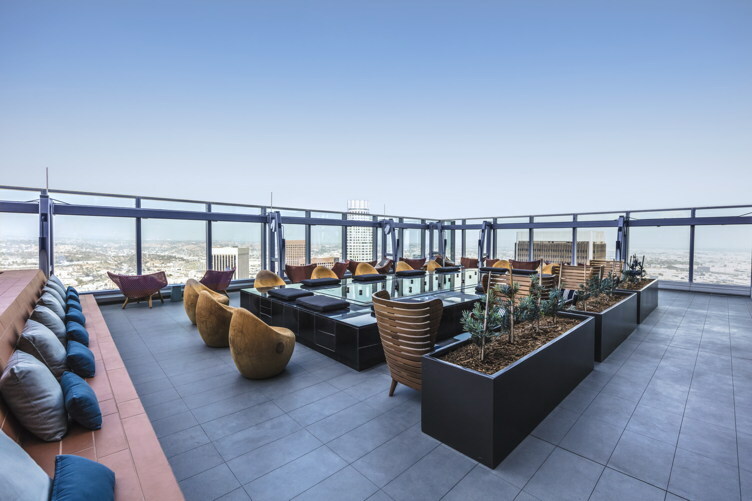 This LEED Gold-certified hotel—the first of its kind in downtown Los Angeles—is sleek, sophisticated and metropolitan, a nice foil to those who want something edgier from their stay. Every element of the design is inspired by architectural historian Reyner Banham’s book, Los Angeles: The Architecture of Four Ecologies, which examines how Surfurbia, Foothills, Plains of Id and Autopia make up the identity of the Los Angeles landscape with an additional element–downtown. 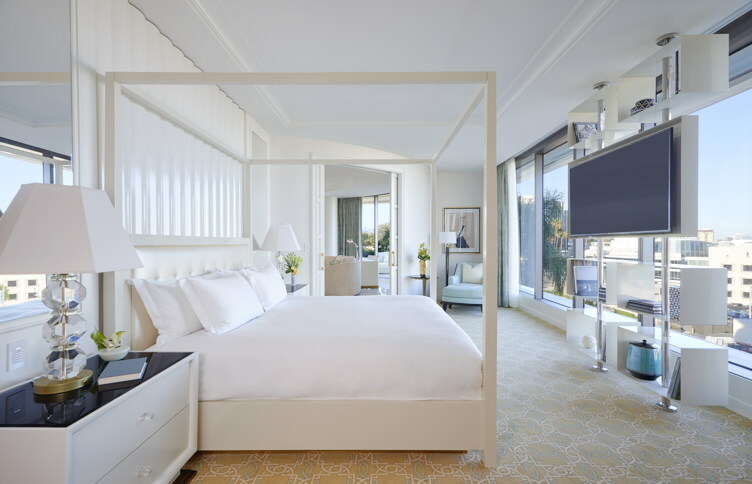 AC Martin Architectural Design Group played up the all-encompassing L.A. angle by including intricate light fixtures inspired by LA’s infamous freeways to billboard-like headboards in each guest room reflecting LA’s classic beach towns, foothills, car culture and urban scene. 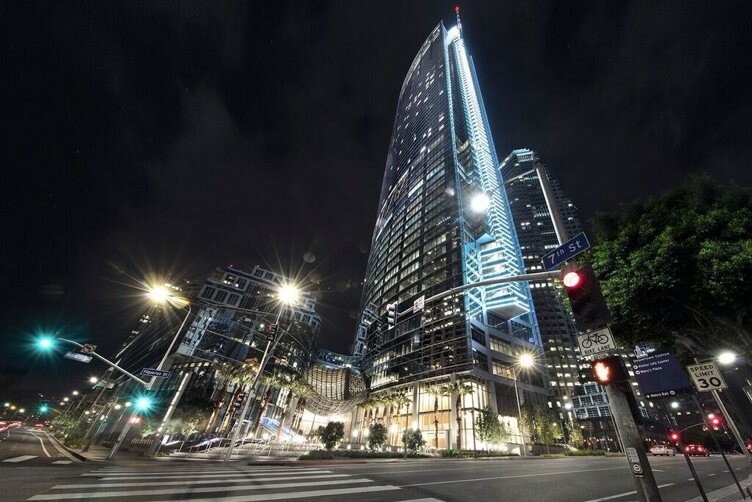 The InterContinental’s 889 guest rooms and 109 suites actually span from the 31st to the 66th floor of the Wilshire Grand Center. It’s 2,500 sq. 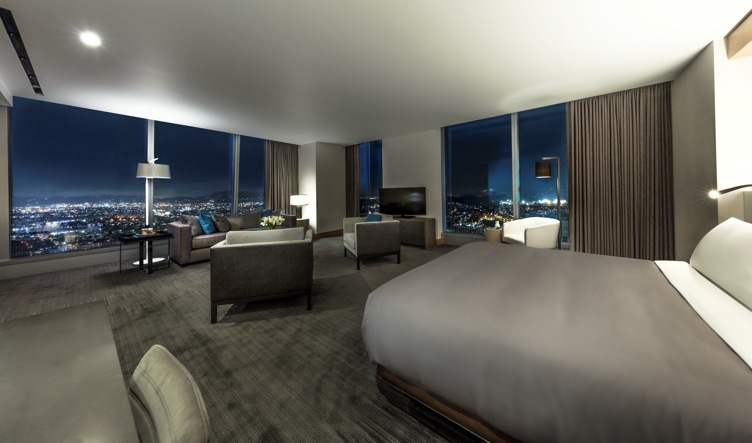 ft. Presidential Suite is the one to beat, offering sweeping views of the Los Angeles skyline, a baby grand piano, soaking tub, spacious dining area with kitchenette, and a separate bedroom with a king bed. The restaurant options here are rife. There’s the Club InterContinental lounge on the 70th floor (which also happens to be, a bit confusingly, the hotel’s reception area); the signature steakhouse, La Boucherie; Dekkadance, a unique farm-to-fork international marketplace; and Sora, an intimate sushi and omakase restaurant offering a refined menu of fresh-cut sushi and prepared dishes presented on the sky-view conveyor belt. You’ll find innovative roles here, interesting and intricately prepared raw fish presentations, and a healthy selection of Japanese whiskies to make the please the most die-hard enthusiast. There are also several bar options. 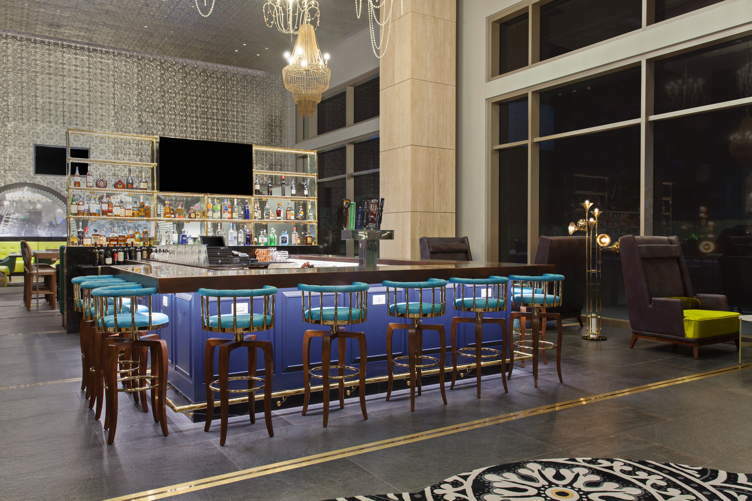 The Lobby Lounge carries over 120 different vodkas, 75 of which are domestic, 25 of which are from California and five of which are crafted within three miles of the hotel. It also serves 100% milk vodka, a 100% quinoa vodka, 100% grape vodkas and 100% rice vodkas. The most expensive option is CLIX from Kentucky: only 2,000 bottles have ever been produced, so it would make sense that you try it here. 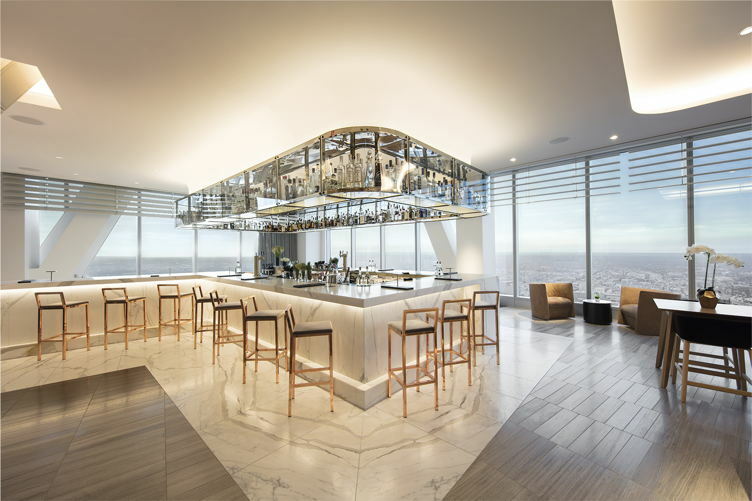 Additionally, the Lounge has the western states’ exclusivity for Grey Goose Ducasse vodka, a collaboration between Grey Goose cellar master Francois Thibault and Michelin-starred chef Alain Ducasse. 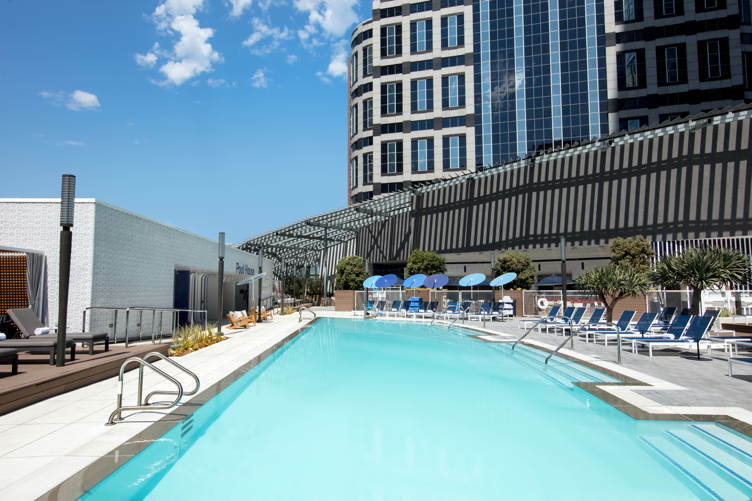 Other imbibing options include No Dive Bar, located on the pool deck, and Spire 73, the tallest open-air bar in the Western Hemisphere. 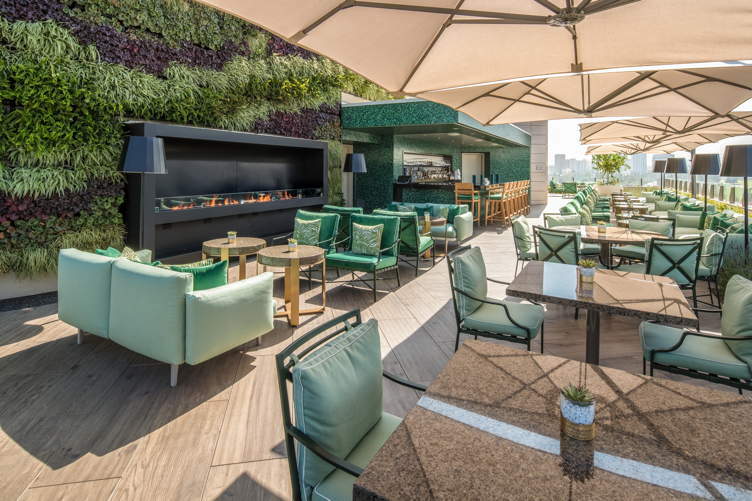 This rooftop lounge offers breathtaking views of the entire city, chic fire pits, signature cocktails and a wide selection of whiskey, as well as culinary expressions to rival the view. 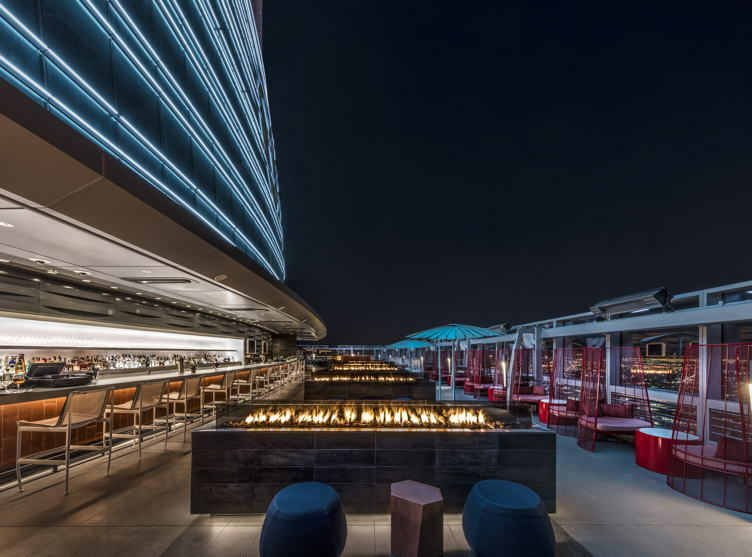 It also requires a reservation and a $25 cover fee at all hours (which is free for guests), ensuring that the type of crowd who hangs out taking in the glittering lights of L.A. is of an upscale crowd. Although there is so much to love here, our favorite part of the hotel was its fitness center. The gym is crazy. It looks like something out of the Matrix, which is perhaps why membership fees are available for locals that can afford its price tag. In addition to its art installations and LED lighting, the gym offers Attitude Fitness, a state of the art equipment facility by Techno Gym with an interactive wellness app to manage guest’s workouts. It’s truly glorious. 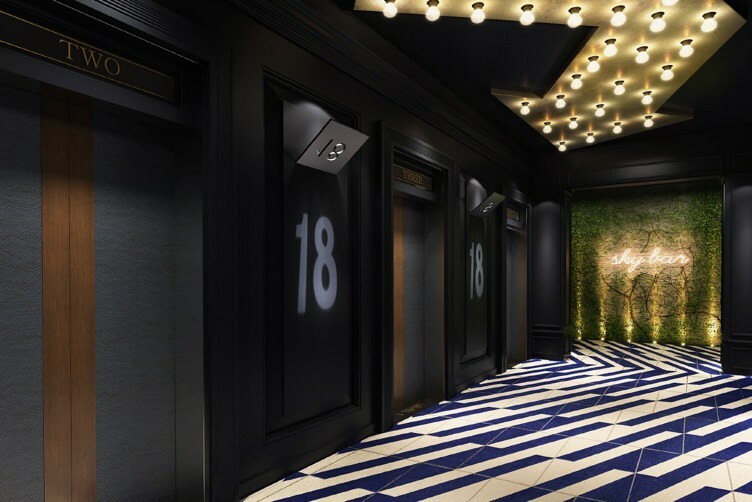 Unbeknownst to most, downtown Los Angeles holds a mysterious secret—and that secret—an underground service tunnel stretching 11 miles long—lies just underneath what is now the newly opened, 350-room Hotel Indigo. Used as passageways to basement bars and speakeasies, the tunnels allowed the Prohibition-era party to go on despite the dry laws above. Clandestine storefronts offered legitimacy to the illegal activities below. Unfortunately, it’s almost impossible to access the tunnels today because, officially, they’re closed to the public. But isn’t it cool to know that they’re just underneath you, a touch of the thrilling and illicit past that made Los Angeles what it is today? 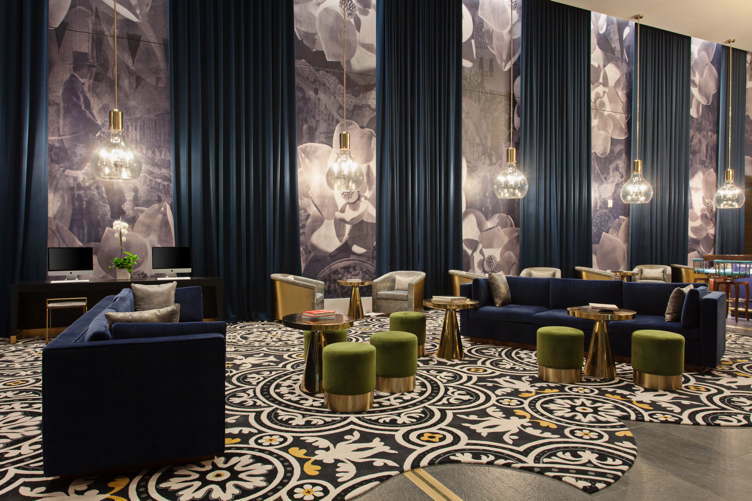 Though this hotel, which is located within the downtown Metropolis mega-project, is a fully modern, millennial-friendly urban retreat, you’ll still get a sense of its historical past in almost every way. 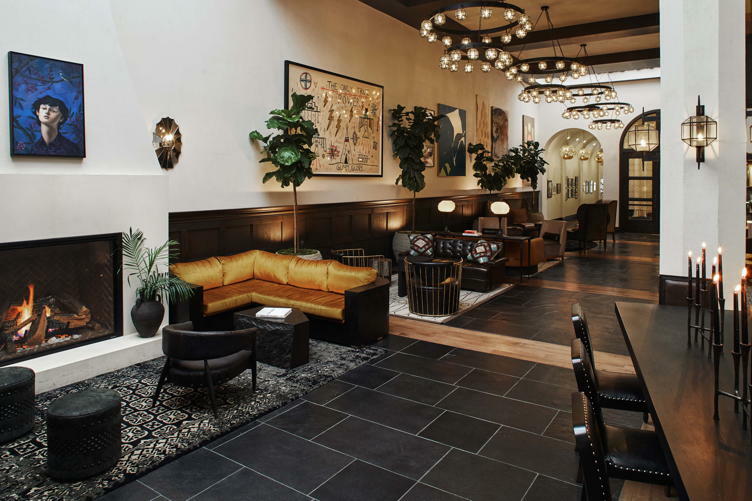 Its distinctive, design-driven interior incorporates elements of the city’s colorful history and pays homage to the early 20th century in Los Angeles in a very specific way: with playful nods to historic Chinatown, Hollywood’s Golden Age, La Fiesta de las Flores (Downtown’s precursor to Pasadena’s now-famed Rose Parade), and the underground speakeasies of the Prohibition Era. 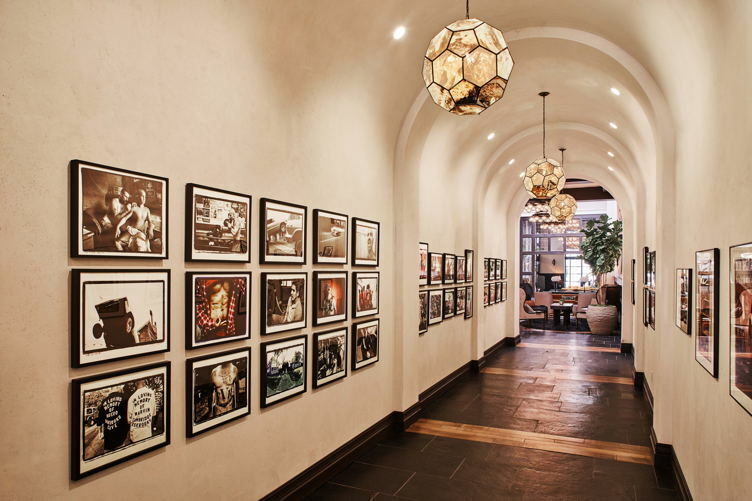 In fact, the hotel focuses on Anna May Wong, the first Chinese-American movie star. 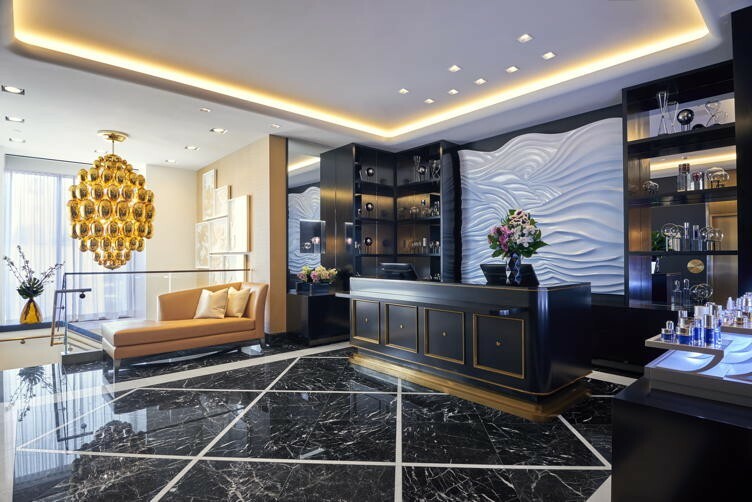 While all of the hotel’s rooms and suites pay homage to Wong in some way, the penthouse pays her the most respect, playing up her fashion icon status and ultimate glamour with fine marbles, bronze finishes and luxurious seating areas, recreating her famous and fabulous living quarters. 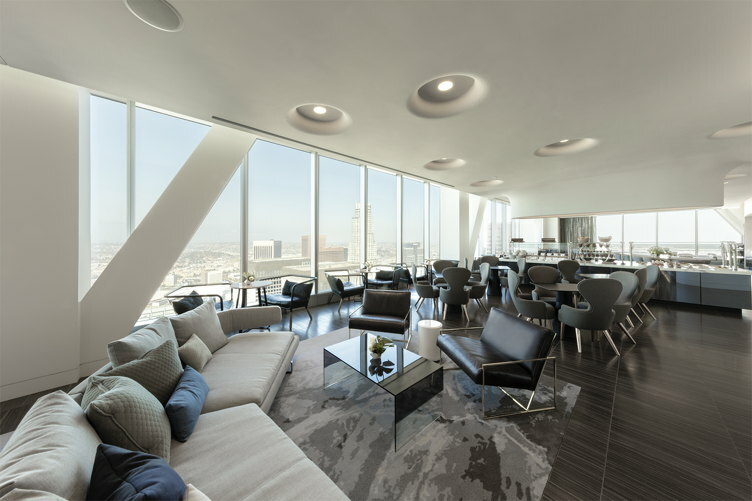 After booking your stay in the penthouse, head over to 18 Social, the penthouse lounge which simultaneously offers stellar views of the LA skyline. It also celebrates the Golden Age of Hollywood by commemorating the end of Prohibition as FDR did with the “FDR Martini” (which was actually created by the former President to celebrate the end of Prohibition) to a locally-created twist on the Moscow Mule, the signature “Pineapple Mule.” There’s also a DJ on hand, but don’t worry, Jazz isn’t his thing. Make sure not to miss the hotel’s on-site restaurant, Metropole Bar + Kitchen. 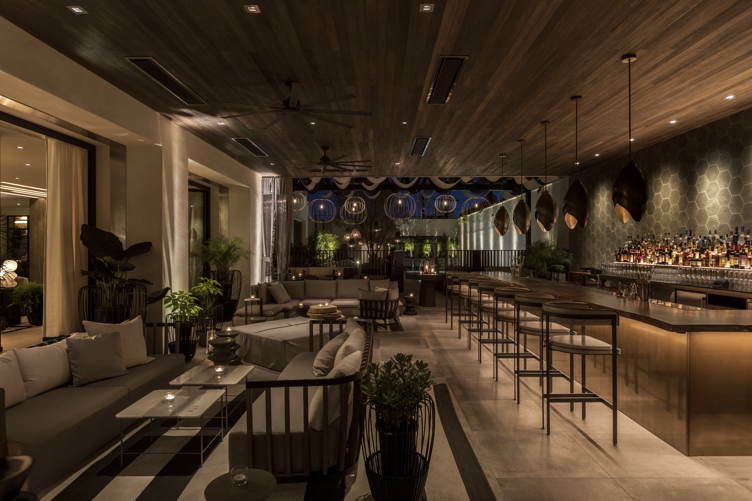 In addition to offering local twists on classic dishes, the eatery will feature a distinctive entrance representing the underground tunnels transported spirits (among other contraband) to the city’s unmarked watering holes. You’ll find cocktails here, sure, but—in true downtown tradition—also a slew of locally-brewed craft beers. 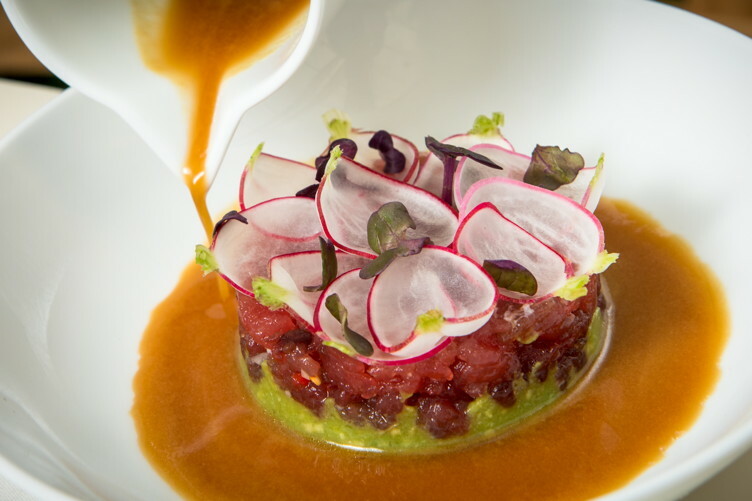 Metropole’s menus highlight local ingredients with small bites such as tuna poke tacos and French dip, as well as fine dining options like honey miso baked wild sea bass and duck confit risotto with foie gras foam. 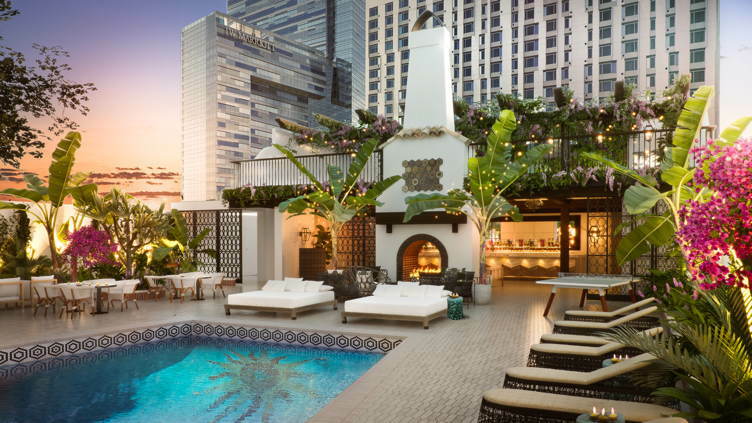 It’s been said that everything old is new again, and that is absolutely the case for the iconic Hotel Figueroa, which has emerged from a two-year restoration this year like a beautiful butterfly from a particularly outdated cocoon. That being said, elements of the hotel’s former Spanish Colonial splendor still exist, but in a completely aesthetically pleasing way. The 14-story, 268 room and suite hotel is, quite simply, awesome. We particularly love that it plays up its historical female heritage. It originally opened in 1926 as an exclusive women’s hostelry by the YWCA, which was, according to the Los Angeles Times, “financed, built and operated by and for femininity,” that served as a safe haven for female travelers. 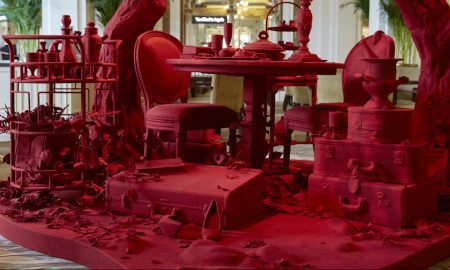 We also adore the hotel’s arty aesthetic. Art, from only L.A.-based artists, is everywhere: on every surface, on every wall, in every hallway, playing up its L.A. pride. 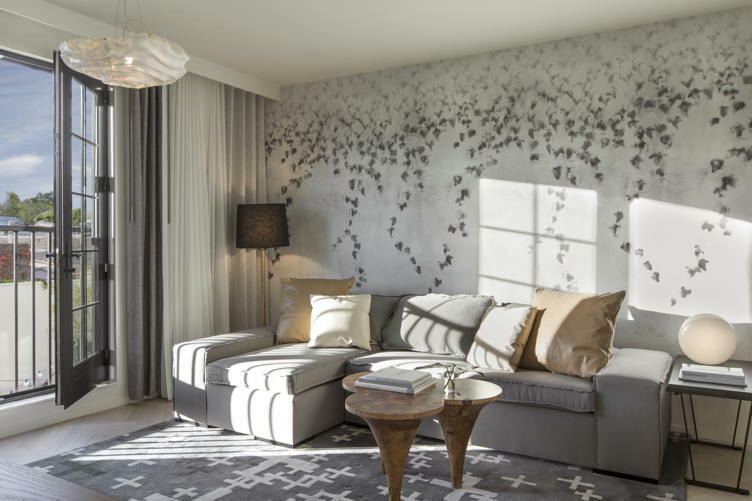 There are also 23 Artist Series Suites, which feel authentic thanks to parlor-inspired seating and bathrooms with deluxe showers that enhance the residential feel of the design. Most bathrooms feature wet-plaster walls and painted accent tile, a nod to the Spanish colonial heritage of the building’s architecture. 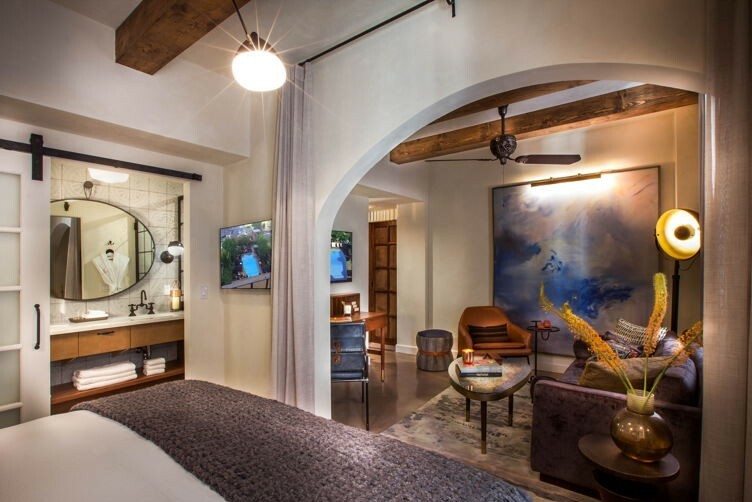 Then, there are 33 Writer Series Suites, which are highlighted by raw-edge leather headboards, luxurious sofas, vintage-style case goods, contemporary lighting and local art. Leather details, wood beams, metal accents, wood flooring and custom millwork create additional layers of warmth. 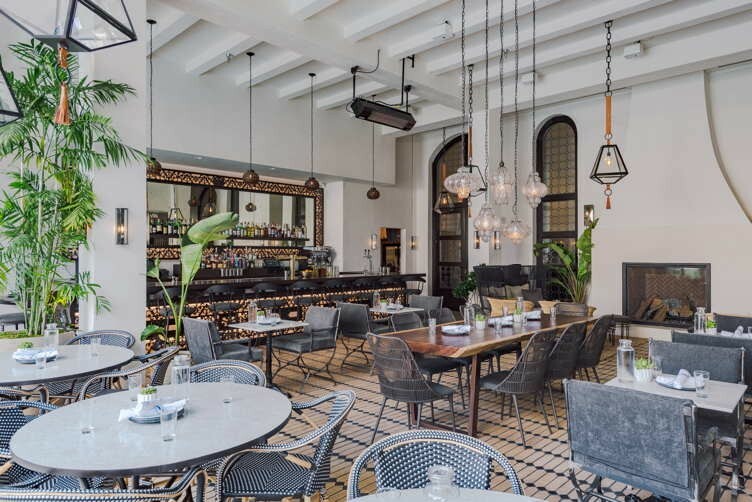 Custom cement tile speaks to both the Spanish architecture of the hotel and the Moroccan style for which it was once known. Each suite in this series features a collection of books by an LA-based author or artist in partnership with The Last Bookstore. There are seven “Signature” suites: The one-bedroom Parador Suite being the larges suite on property with a separate dining room area that seats six guests, includes an efficiency kitchen and refrigerator for hosting, a wet bar, spacious living room, one and one-half bathrooms, terrace with patio seating and stairway that allows for private access to the bar and pool below. 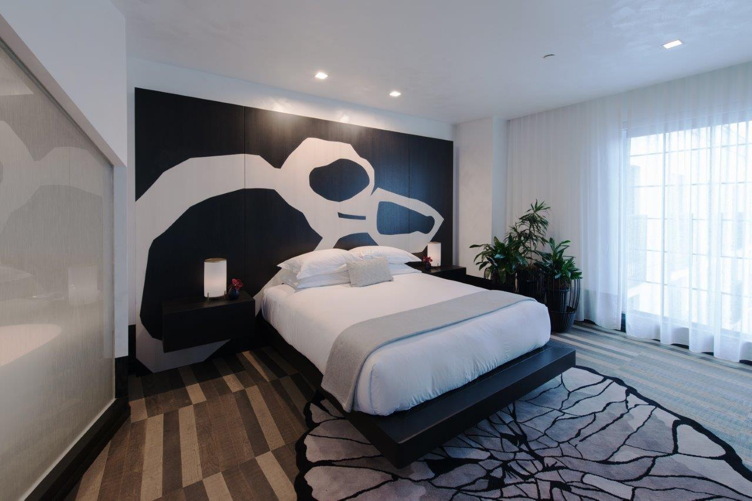 The Cabaña Suite is similar in floor design and boasts the largest terrace of any room on property. The Casablanca Suite has the coolest feature of the hotel—a secret door leading to a private dining and cocktail area that can also be reserved separately. 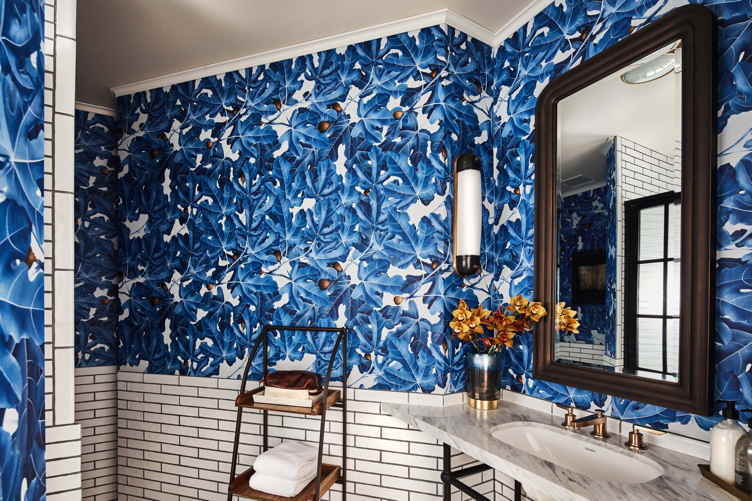 All rooms include free high-speed Wi-Fi, an iPad with guest request technology, a Vittoria espresso maker, and a complimentary minibar with water and snacks that’s refreshed daily—rare in today’s age of luxury hotel nickel and diming. 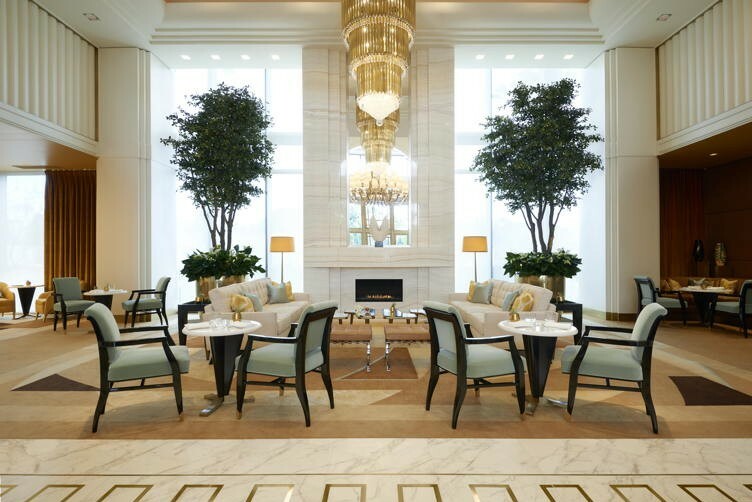 Other amenities offered to all guests include a welcome tea service featuring a bespoke custom-blended fig tea by DTLA-based tea company, August Uncommon; a sleep program; pet-friendly services; fitness trainers; a Tesla house car for complimentary transportation within DTLA, based upon availability; two Tesla Charging Stations and one universal connection for EV’s on property. This historic hotel makes sure that guests are spoiled for options as well when it comes to culinary offerings. There are two destinations restaurants, Breva and Veranda, conceived by four-time James Beard Award nominee Chef Casey Lane of Tasting Kitchen and Casa Apicii, whom also, as you might recall, helms La Peer’s Viale de Romani, while Dushan Zaric, New York City’s Employees Only cocktail mastermind, pours a progressive spirit into the hotel’s bars including Bar Figueroa, Rick’s, and the reservations-only, Bar Alta. 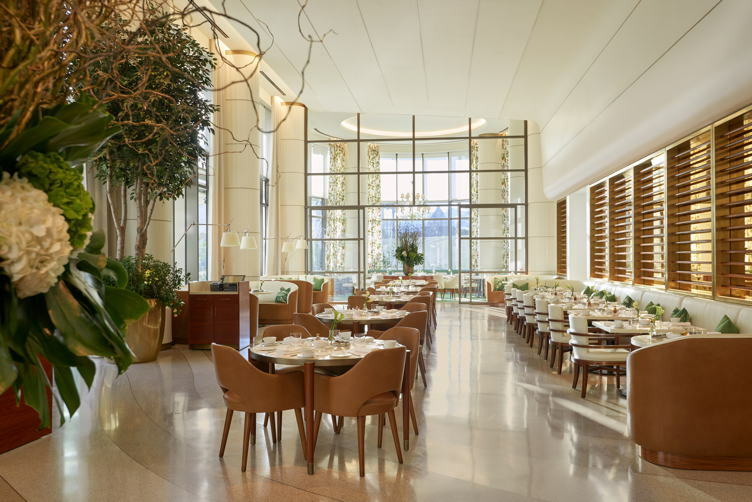 Just inside the spacious lobby is Breva, meaning “young fig,” a Basque-inspired brasserie with Mediterranean influences, with a menu that captures the flavor and conviviality of the coastal Mediterranean region while incorporating the best of local and seasonal ingredients. 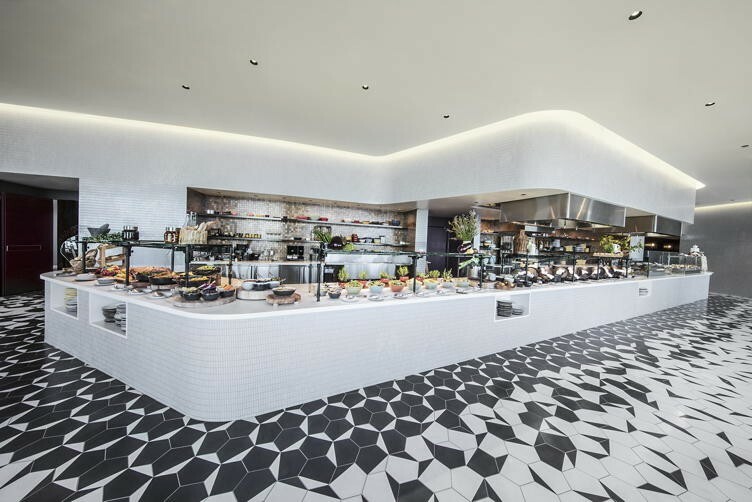 Signature items range from whole grilled branzino and Huntington Meats ribeye to veggie-focused dishes with distinctive preparations such as Moorish spiced carrots with hazelnuts and tangerines. We loved Veranda, the lighter lunchtime and cocktail-hour offering adjacent to the coffin-shaped pool (which is set among cactus, eucalyptus and fig trees, creating a lush oasis for guests surrounding the courtyard). This relaxed al fresco dining venue with comfortable couches and cozy seating nooks that offers coastal Mediterranean-inspired cuisine with an al forno perspective, driven by a wood-burning outdoor oven with selections that range from salads and flatbreads to meat, fish and vegetable focused dishes. Try the zucchini flatbread with basil, burrata and lemon; the fried lollipop kate with dill crème fraiche and roasted chicken. 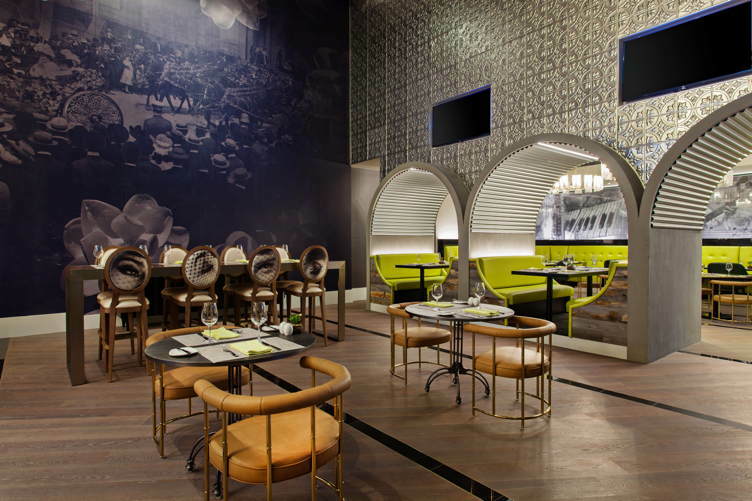 There’s also the newly opened Rick’s, a Moroccan-inspired oasis that pays homage to Humphrey Bogart’s Casablanca bar. There’s a velvet rope and craft coastal-inspired cocktails, which should tell you enough about this newly reopened two-story structure: it’s destined to be a hot spot. 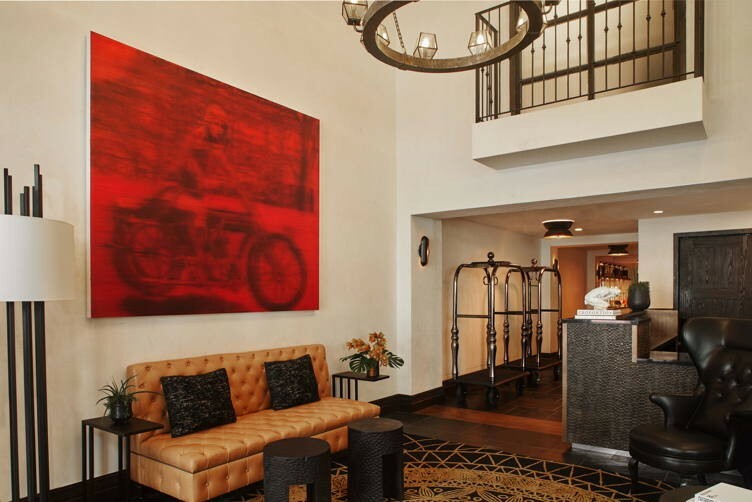 Our favorite place to hang out, however, will be Bar Alta, the crown jewel of Hotel Figueroa’s bar program. This reservation only spot is only open to members (which you can become, hint hint, by staying at the hotel) and provides the highest level of Zaric’s cocktail craftsmanship, with every bell and whistle from centrifuges to evaporators to smokers and other culinary tools. There are only 28 seats here, and you can’t order a drink. Yes, that’s right. You’ll have an open discussion with your bartender, who will ask you how you feel, obtain your preferences, and then make alcoholic magic happen tableside right in front of your eyes. We guarantee it: you’ll be feeling just fine after some liquid therapy.